Russia's Sevmash enterprise is expected to launch the construction of a next generation Project Yasen-M multirole nuclear submarine of on March 16, the plant's press service reported on Friday. 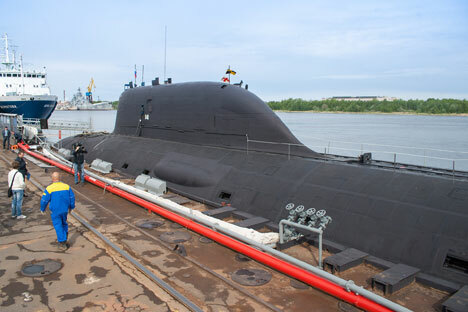 "Navy Commander Admiral Viktor Chirkov has ordered that the submarine be named Arkhangelsk. This missile carrier will become the fifth Yasen Project multirole nuclear submarine, developed by St. Petersburg's Malakhit naval design bureau," it said. The project uses a lot of cutting-edge technological solutions, the press service said. The flagship of Project Yasen, the Severodvinsk nuclear submarine, built by Sevmash, was transferred to the Russian Navy on June 17, 2014. The updated Project Yasen-M envisages the construction of the multirole nuclear submarines Kazan, Novosibirsk and Krasnoyarsk. The vessels will be equipped exclusively with Russian-made electronic warfare systems and other elements. Under the Russian Naval Doctrine, the Project Yasen submarines will form the core of Russia's fleet of multirole submarines in the future.